Noah Addis’ series “Future Cities” examines the worldwide phenomenon of informal high-density urban settlements through photographs made in major cities across the globe. Although different in form, most unplanned communities share a common story: rural migrants searching for work create improvised shelters on unused plots of land from debris and natural elements. According to the United Nations, there are one billion people living in slums and unsanctioned communities as of 2003 and the number is estimated to grow to three billion people by 2050. In response to this rapid expansion, Addis has traveled the globe seeking out cities in which a significant percentage of the population lives in unplanned urban structures. From the outside, the spontaneous growth of unplanned housing may seem chaotic, but Addis finds creativity and vibrancy in the architecture of makeshift communities. Structures erected with discarded metal siding, bedsheets, bedframes, and wooden poles express the adaptive nature of self-built communities whose residents innovate out of necessity. Addis is interested in how the ingenuity of the “do-it-yourself” structures might inform urban planning and sustainability issues. Moreover, Addis hopes to draw attention to the hardship faced by a rapidly growing portion of the world’s population who lack basic resources. Addis completed his BS in Photography from Drexel University (1997) and shortly after began working as a staff photographer for the Star-Ledger Newspaper in Newark, NJ. 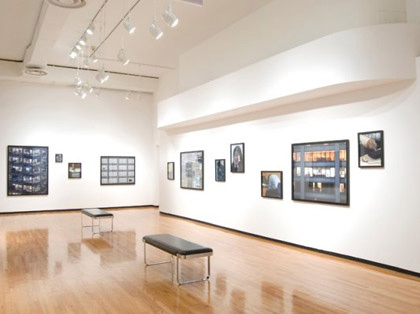 He has held solo exhibitions at the Church Gallery, Philadelphia, PA (2013), the Center for Emerging Visual Artists, Philadelphia, PA (2011), the Loyola University Art Museum, Chicago, IL (2011), The Salt Institute for Documentary Studies, Portland, ME (2010), and The Salt Institute for Documentary Studies, Portland, ME (2010). His works are held in the collections of The Philadelphia Museum of Art, the Center for Emerging Visual Artists, Philadelphia, PA, and the Free Library of Philadelphia. He lives and works in Columbus, OH. United Nations Human Settlements Programme. 2003. The challenge of slums global report on human settlements, 2003. London: Earthscan Publications. Lallubhai Compound Eviction #1, Mankhurd, Mumbai, 2011.